As of January 2013, LoyalTee is under new ownership! It's an exciting time for us and we're working hard behind the scenes, coming up with some new shirt ideas for all of you. To stay in touch with LoyalTee, visit our site, sign up for e-mails, like us on Facebook or follow us on Twitter. The best is yet to come! 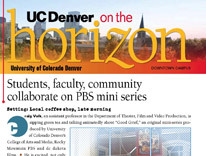 On the Horizon - CU Denver magazine - "Diners, Drive-ins and T-shirts"
Denver Westword - Best of Denver - "Best Colorado T-shirts"
"LoyalTee has its heart in all the right places." Denver's Westword awards LoyalTee the Best of Denver for Colorado T-shirts 2012. 5280 Magazine - "Bringing it Back"
Denver's 5280 Magazine says, "For those of you who believe that the home of the Broncos will always be Mile High Stadium (period), the folks at Denver-based LoyalTee have got you covered...."
Colorado Biz Magazine - "Colorado Cool Stuff"
"Launching earlier this year, the nine-shirt LoyalTee line includes wearable tributes to such local landmarks as Johnson’s Corner, Rocky Flats Lounge and Stella’s Coffeehaus, as well as top seller Mile High Stadium. 'It’s grown into a passion - it’s addictive.'" Read more at cobizmag.com. Washington Park Profile - "Around the Town"
"One way to proclaim your faith in local commerce is to wear it on your chest!" Read more about what the Washington Park Profile has to say about LoyalTee in their September 2011 issue. Westword - "Talking Shop: LoyalTee shirts pay homage to local landmarks"
"Not only is the tag on each tee a postcard telling the history of the place it celebrates, but LoyalTee lives up to its name by donating a percentage of each sale to the lauded businesses." Read more about the origins of LoyalTee at Westword. The Summit Daily - "Moose Jaw deemed 'beloved landmark' by shirt makers"
"Lynda Colety, who has owned the Moose Jaw for 37 years, said she was honored her restaurant was chosen as a beloved Colorado landmark." Read more about this Frisco destination and why we chose them at the Summit Daily, Summit County's newspaper. The Nugget Denver - "Loyalty at its Finest"
"We should all go out and discover what's interesting about our town or the town we're visiting. Plus a portion of each sale goes back to the featured business. Now that's worth taking home with you." Read more on The Nugget. "Begun as a CU Denver grad school project, this new line of shirting reps the now-defunct Denver beer Tivoli, plus logos of famous CO bars (like Southeast's Bonnie Brae, Frisco's Moose Jaw, and Boulder's Rocky Flats ), all of which promote a “love of beer, food and t-shirts” -- perfect, as too much of the first two will ensure you'll be too embarrassed to go without the third." Read more at Thrillist.